Discussion on defining district borders for Dallas is in progress. If you know the city pretty well, please share your opinion on the talk page. Dallas is a huge city with several district articles containing sightseeing, restaurant, nightlife and accommodation listings — have a look at each of them. Dallas  is the largest and most populated city in the Dallas-Fort Worth Metroplex, which is also referred to as the Metroplex and also DFW. Located in the north central portion of the state, the Metroplex is the most populated area in Texas. The City of Dallas by itself is the third most populated in the state behind Houston and San Antonio. DFW is home to the Dallas Cowboys of the National Football League, and you'll regularly be reminded of the Metroplex's mass enthusiasm for the team. With more shopping centers per capita than any other city in the US, Dallas is also known as a shopper's paradise. Downtown is home to a burgeoning residential and nightlife district. Downtown is surrounded by highways (Woodall Rodgers Freeway to the north, Central Expressway to the east, I-30 to the south, and I-35E to the west). The area located north of downtown and south of the Park Cities and Northwest Dallas is generally known as Oak Lawn in the western neighborhoods and Uptown in the eastern neighborhoods. It includes established Turtle Creek high-rise living and a multitude of parks and restaurants. It is made up of dense, urban neighborhoods of mostly townhomes, apartments, and condos. Oaklawn also includes the LGBT-friendly district of Cedar Springs. Formerly a mostly industrial area, the Design District west of Oak Lawn is a growing residential area. Uptown is a playground and shopping ground for the beautiful people of the city. It extends from Woodall Rodgers Freeway on the south to the Park Cities on the north, and from Central Expressway on the east to the Katy Trail on the west. Immediately north of the official Uptown public improvement district, and sometimes included as part of it, is the Knox Park neighborhood, which includes restaurants and a plethora of upscale home furnishings shops. '"Knox/Henderson" is a split personality urban neighborhood worthy of its own designation. The Knox side west of Hwy 75 is the more upscale half, with many restaurants and upscale home decor shops. The Henderson side lagged behind its Knox half, but is now just as trendy, with a more low-key, relaxed vibe. Henderson hot spots now line Henderson all the way from Hwy 75 to Ross. Knox and the western half of Henderson are very pedestrian friendly. Knox/Henderson is just a short walk up the Katy Trail from the West Village. This large area is north of I-30, south of Mockingbird Lane, and extends east from Central Expressway to White Rock Lake and beyond. The closer-in areas are some of the "streetcar suburbs" built in the 20th century from the teens to '30s, with quaint bungalows and neighborhood strips that are teeming with restaurants, taverns, coffeehouses, wine bars, and vintage shops. A large oasis of laid-back in a sometimes uptight city, homey-but-hip East Dallas is a great place to mingle with locals. A largely residential area north of East Dallas borders Garland on the north and Mesquite on the east. This area is centered along the northern I-635 loop (LBJ Freeway) and extends up around the Dallas North Tollway to Addison and Plano. It is made up of several upscale neighborhoods, which are north of the Park Cities (Highland Park and University Park) and mostly south of LBJ. Highland Park and University Park are independent towns within the borders of Dallas. They are located along US 75 (Central Expressway) north of the Uptown area. One of the wealthiest areas of the city, the "Park Cities" are mostly residential, but also offer world-class shopping opportunities at Highland Park Village (corner of Mockingbird Ln. and Preston Rd.) and elsewhere. North Park mall is on the northern edge of the Park Cities. University Park is home to Southern Methodist University (SMU), the Meadows Museum at SMU, and the George W. Bush Presidential Library. Dallas Love Field, the city's second biggest airport, is in this area. The area's borders are roughly formed by I-635 LBJ to the north, the Dallas North Tollway to the east, the border with the City of Irving to the west (just west of I-35E), and the Trinity River to the south. Largely a blighted area of poverty, its borders are roughly formed by the Trinity river to the north and east, I-30 to the south, and Loop 12 to the west. The area does feature the one-of-a-kind Belmont Hotel, which has arguably the best views of downtown. West Dallas is easily connected to the Oak Cliff area and is poised for re-development as part of the Trinity River Project. The neighborhood is now accessible via the recently completed Margaret Hunt-Hill Bridge, which crosses the Trinity River and connects to Woodall Rodgers Freeway. The bridge is the first of two bridges in the city designed by famed Spanish architect Santiago Calatrava. A large, mainly residential district southwest of downtown that was once a separate city. North Oak Cliff is another "streetcar suburb" and is home to upscale homes, from vintage 1930's bungalows, to mid-century modern, to new contemporary. The Bishop Arts District, centered on Bishop and Davis streets, is one of the city's hottest areas for new restaurants, cafes, and boutiques, drawing an eclectic crowd in which the creative class and the gay community are well-represented. North Oak Cliff is a slice of Austin in Dallas. South Dallas is the area southeast of Downtown Dallas. The area is home to the Texas State Fairgrounds, Fair Park. The park is open all year and is home to multiple museums. The Cotton Bowl stadium is located in Fair Park. The University of Texas and the University of Oklahoma face off on the gridiron here every year in the fall during the Texas State Fair. The Exposition Park neighborhood across from Fair Park and the DART Fair Park light rail stop is a little hamlet of hipster bars, clubs, and restaurants. Arlington, home to AT&T Stadium, Six Flags Over Texas, Six Flags Hurricane Harbor, and the Rangers Ballpark in Arlington, lies to the west of Dallas. Irving, formerly the home of the Dallas Cowboys' stadium, Texas Stadium (now demolished), serves as the eastern gateway to DFW International Airport. Frisco, a northern suburb surrounding the Dallas North Tollway and State Hwy 121, is home to the Stonebriar Mall, IKEA, the Frisco RoughRiders baseball team, and the Major League Soccer team FC Dallas, which plays at Toyota Stadium. The stadium is nestled into a cluster of restaurants and shopping near old downtown Frisco. The suburbs of Carrollton and Lewisville, north along I-35E, have less to offer in terms of attractions, but provide ample tourist accommodations, plenty of restaurants, and are reasonably close to any Dallas destination. The same might be said for Richardson and Plano, which lie north from Dallas along US-75. Grapevine, just north of DFW Airport, has a nice historic main street area and numerous wineries. Many non-natives often have a hard time sizing up Dallas. Dallas sometimes can fit the typical Texan stereotypes (Western and laid-back), and sometimes it may fit the more notorious stereotypes (pretentious, unfriendly, and sterile), but not always. The truth is it can fall somewhere in between. Dallas is a wonderful place with a great deal to offer and an immense and diverse set of attractions, food, and people. From the ultra-modern and posh Uptown and Victory Park developments, to the old-town elegance and upper-crust attitude of Turtle Creek, to the largely-suburban feel of North Dallas, to some of the struggling neighborhoods of West Dallas, it is virtually impossible to neatly categorize Dallas beyond this. It is a large city, and with that in mind, you should enjoy visiting Dallas. Being in the American South, Dallas has a subtropical climate with generally mild winters, very hot summers, and a very wet spring and fall in between. In winter and summer it can also be a very dry place, as it receives warmer, drier weather from the Mojave Desert in the west and the Great Plains in the north. Winters are generally mild, with average highs in the 50s and 60s (10-20ºC) and average lows around the freezing mark. It does snow in Dallas a couple times a year, and there is the rare day where temperatures will not get out of the 30s (0-5ºC). There is also the danger of freezing rain and ice storms. Spring and fall bring very pleasant temperatures, but spring is also known for its storms. With Dallas lying within Tornado Alley, springtime weather can be quite volatile and severe storms often occur. Summers are vey hot and dry, with temperatures often surpassing 100*F (38ºC). Average rainfall in Dallas is 37.1 inches (942.3 mm) per year, and average snowfall is about 2.5 inches (63.5 mm) per year. Most people who come to Dallas arrive by air since the Dallas/Ft. Worth metroplex is home to DFW Airport. Coming from the south, I-45 is the major highway for travel between Houston and Dallas, while I-35 connects the city to Austin and San Antonio.If you come in on I-35 you need to keep in mind that, a few dozen miles both north and south of the "metroplex," the interstate splits into I-35W (which runs north/south through Fort Worth) and I-35E (the branch that runs north/south through Dallas). Miss the split and you'll wind up in a different city. Coming from the west, Dallas is reached by either I-20 on the south side or I-30 which comes directly into downtown. Both of these interstate highways approach Dallas from the east. I-20 comes from Shreveport and I-30 comes from Texarkana. The Dallas/Fort Worth area (IATA: QDF for all airports) is served by two major airports, Dallas-Fort Worth International Airport (IATA: DFW), and Love Field (IATA: DAL). Love Field is within the city limits not far northwest of downtown. Love Field is home to Southwest Airlines , and is much closer to downtown. Love Field is also a focus city for Virgin America and is also served by Delta Connection to Atlanta. 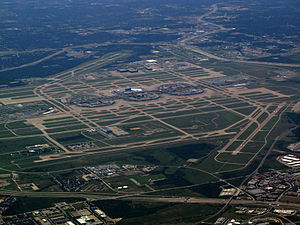 DFW airport  is one of the largest airports in the country by passenger volume, and served by a total of 24 domestic and international air carriers. Equally positioned between Dallas and Fort Worth, DFW is a great airport to fly into. Don't forget that as you drive out of the airport, you will have to pay a toll to leave. DFW is the chief hub of American Airlines, which controls well over 80% of all the flights. WiFi is provided by AT&T for free. Addison Airport (IATA: ADS, ICAO: KADS, FAA LID: ADS) is a public airport located in the town of Addison, an incorporated city in Dallas County, Texas, United States. It is nine miles (14 km) north of the central business district of the city of Dallas. Addison Airport (ADS) was conceived in 1954 by a group of flying enthusiasts, and was developed under the direction of Henry Stuart. Construction of the airport was completed in 1957. Stuart’s group sold the airport to the Town of Addison in 1986. It is now the third largest general aviation airport in the country and boasts a runway of 7,200 feet. No matter which airport you are flying into or out of, if it is during rush hour, traffic will be a factor. Make sure you budget at least 2-3 hours to get to/from the airport if you are traveling on I-635, the Bush turnpike (SH-190), or 75 (Central Expressway). It will probably only take you an hour (and traffic has been getting better lately), but it is far better to have that extra hour of cushion than to be stuck on the one road that will get you where you need to go, and to be moving at a crawl. Once you've arrived at the airport, you will probably do best to take one of the Shared Ride shuttle services. They offer door to door pickup and drop off, probably costing ~$30 for ~20 miles, which will get you to most places. You might meet an interesting person who is also new to town, or a friendly local Dallasite who didn’t want to park his or her car at the airport. For DFW, there are courtesy phones that will let you ring them directly (for free), and they are usually pretty quick about pickups and drop offs. (at most adding an extra 30-40 minutes while you wait for them to pick up more people, or to drop your fellow passengers off on the way to your place or hotel). Air taxi and air charter companies such as Jetset Charter , Monarch Air Group , Mercury Jets  fly a variety of private charter aircraft and jets, from charter luxury Gulfstream's down to economical piston twins for small groups and individuals. Air charter brokers such as Alliance Air Charter  and Private Jets Dallas  offer access to private planes located around the world for flights to Addison Airport, and several Dallas area airports focused on private aviation, including Dallas Executive (IATA: RBD), Mesquite Metro (IATA: HQZ), Lancaster Regional (IATA: LNC), Grand Prairie Municipal (IATA: GPM), and more. Regarding public transit at Dallas-Fort Worth International Airport you have two options to reach the airport. The DART Rail Orange Line has trains that depart from the lower level of Terminal A to Downtown Dallas. For passengers arriving at other terminals just take either the Skylink train or the Terminal Link shuttle bus to Terminal A. The Skylink train is faster, but is only available inside the security checkpoints. So if you need to go out to claim baggage, then you'll need to use the Terminal Link shuttle bus instead. The second option is to take two free shuttles to the CentrePort/DFW Airport rail station of the Trinity Railway Express (TRE). As you walk out of the arrivals hall at DFW, turn right and wait under the sign for the 'Remote' South shuttle. It’s a free bus that takes you to another free bus at 'Remote South' station, which takes you to the Trinity Railway Express (TRE) train station or Dallas Area Rapid Transit (DART) bus 408 . The latter option is more useful if you are heading to Fort Worth however trains do not run on Sundays. To get to Downtown Dallas from Love Field, simply take the DART Bus 524  to the Inwood/Love Field DART rail station which is located on both the Orange Line and Green Line and take the DART rail into Downtown. There are two Amtrak  routes which serve Dallas/Fort Worth, the Texas Eagle between San Antonio and Chicago, and the Heartland Flyer between Fort Worth and Oklahoma City. To get here from Oklahoma, take I-35 or US 75 south. To get here from Houston, it's ~250 miles north on I-45 (which turns into US 75). To get here from Austin, take I-35 North. To get here from Louisiana, take I-20 west. Dallas is the junction-point for most cities within a 200-300 mile radius, with good road service to and from. Any map of the United States should have enough information to get you into Dallas with no problems. However, once you are here, watch out for traffic. Traffic tends to go towards the city centers in the morning, and away from the city centers in the evening. Major choke points are 75 South in the morning (what takes 20 minutes with no traffic, ends up taking 1-2 hours with traffic). I-635 near the Dallas North Tollway and near US-75 is also usually a mess, since I-635 (being the beltway that runs all around Dallas) is an often-traveled road. Also watch out for I-35E southbound in the mornings. Roadway construction is also a common occurrence in Dallas and should be budgeted for. The farthest eastern end of the George Bush Turnpike (SH-190), many portions of SH-121, and the central portion of IH-635 are, as of July 2011, either beginning or are currently under major construction. US-75 is also called "Central" or "Central Expressway", and turns into I-45 just south of Downtown. I-635 is sometimes called LBJ, which stands for Lyndon B Johnson. There are two branches of I-35. I-35 splits into I-35W at Denton (30 miles north of Dallas) through Fort Worth to Hillsboro (50 miles south of Dallas), and I-35E that runs from Denton through Dallas to Hillsboro. After I-35W and I-35E reach Hillsboro, they simply rejoin as I-35. Toll roads are an increasing part of commuting in the Metroplex. Toll collection is all electronic, so there are no toll booths to warn you that you are entering a tolled lane. Tolls are also higher for cars that do not have an accepted toll tag. Toll roads can save you time, but if want to avoid them, plan ahead or check signs carefully. Greyhound . Bus stop is near the center of downtown at 205 S. Lamar. Shofur, . Runs express luxury buses from Dallas to Houston, San Antonio, Waco and Austin with free wifi and power outlets for all passengers. Vonlane, . Runs first class buses from Dallas to both Houston and Austin equipped with various amenities such as leather seats, electircal outlets, ample leg room, free Wi-Fi, and satellite TV. Bus stop is at the Doubletree Love Field hotel located at 3300 W. Mockingbird Ln. Buses also run to and from Shreveport on the weekends, which is sponsored by the casinos. This is more for the locals to go and get their gambling fixes, but ask around if you're interested. Megabus, . Service from Houston, San Antonio, Austin, Memphis, and Little Rock. Bus stops are located at DART East Transfer Center, 330 North Olive Street downtown and 710 Davis St in Grand Prairie. Fares from $1 and up. El Expreso, . Mexican trans-border bus line, also serves destinations throughout southeastern United States. Bus stop is located at 1050 N. Westmoreland #124 in Dallas. Autobus Americanos, . Mexican trans-border bus line with services to various points in Mexico. Bus stop is located at 627 N Westmoreland St in Dallas. Turimex Internacional, . Mexican trans-border bus line with services to various points in Mexico. Bus stop is located at 501 E. Jefferson Blvd in Dallas. Omnibus Mexicanos, . Mexican trans-border bus line with services to various points in Mexico. Bus stop is located at 201 E. Jefferson Blvd in Dallas. Shuttle Wizard, . A cheap and safe private shuttle service, especially for those that don't know how to move around Dallas. The simplest and most reliable way to get around Dallas is by car. Gas stations are plentiful and most sell both regular unleaded and diesel fuel. Highways and many major arterial roads can become heavily congested during rush hour, which occurs Monday through Friday, approximately 7:30am—9:00am and 4:00pm—6:00pm. Avoid driving at these times, especially highway 635. Tune to AM 1080 for traffic and weather reports every 10 minutes. Accidents are common and tend to cause traffic jams on the major highways at random intervals. The Dallas Area Rapid Transit or DART has an extensive system of buses and a large light rail network with four different lines. Unfortunately, life in Dallas fits around the use of personal automobiles as opposed to the ease of using public transportation most of the time. And locals will generally be unable to assist you with the use of public transportation. The light rail hits many tourist destinations in the downtown area, but it generally works best for commuters. The trains run every 12 minutes or so during rush hours, but slow down to as few as two trains every hour at other times of the day. Buses may get you most places in the city, but will usually require multiple transfers and there can be long wait times between buses. Also understand, that suburban Arlington, TX, with a population of roughly 400,000 people, is the largest city in America that has no public transportation network of buses or trains. You can get an excellent trip plan by visiting the DART website  or by calling their information phone number (214-979-1111). Tickets consist of either two hour passes ($2.50 and up) or day passes ($5 and up) and are generally collected on the honor system; the day pass because you will almost certainly need to take a lot of buses to get where you need to go. Most buses and the entire light rail have service from around 5:00AM to midnight. There are no buses late at night. Bus drivers will check tickets upon boarding; light rail trains have infrequent random checks, usually during rush hour. There are a few taxi companies located in Dallas. If you need a ride you need to call and/or notify them in advance as taxi's cannot be hailed on the street outside of various cab stands located at various parts of downtown proper. Ride share services operate in the city as well. Dallas like many large American cities, is diverse. The Dallas-Fort Worth area is home to more than 100 languages. Signs can be found in Spanish, Vietnamese, Korean, and Chinese among others, but English is the lingua franca for the majority of the population in the Metroplex. Knowing some Spanish may help in certain neighborhoods, but most people will speak English. Dallas Aquarium at Fair Park - See over 6,000 aquatic animals at this aquarium located in Fair Park in the southern part of town. Dallas Arboretum and Botanical Gardens, . Located along the south banks of White Rock Lake in East Dallas. Dallas Museum of Art - Large museum that offers great works of art from eastern and western cultures, from all ages. Dallas World Aquarium, Downtown, . More than just an aquarium, this unique zoo tour starts at the canopy level of a rain forest and winds its way down past many types of animals and into the aquarium below. Dallas Zoo, in Oak Cliff. Over 8,000 animals can be seen at this 97-acre zoo. The Dallas Cowboys , Dallas' famous football team, plays at AT&T Stadium (formerly Cowboys Stadium), a short ways west of Dallas in Arlington. The Dallas Mavericks play at the American Airlines Center in Dallas/Downtown. They won the 2011 NBA Championship. The Dallas Stars play at the American Airlines Center in Dallas/Downtown. Dallas' professional ice hockey team. Museum of Geometric and MADI Art  - Museum focusing on geometric and MADI (Multichannel Audio Digital Interface) artwork. The SMU Mustangs , representing Southern Methodist University and members of the American Athletic Conference, are the most prominent college sports program on the Dallas side of the Metroplex. SMU's main athletic facilities are on its campus in University Park. The most prominent venues are Gerald J. Ford Stadium (football) and Moody Coliseum (basketball). The Texas Rangers play at the Rangers Ballpark in Arlington. Dallas' professional baseball team is the 2010 and 2011 American League Champions. Perot Museum of Nature and Science A huge, very new complex located in 2201 N Field St. A must-see! But get your tickets early, sells out quickly on busy days. Sixth Floor Museum, dedicated to the assassination of President John F. Kennedy, is located downtown in the same building from which Lee Harvey Oswald fired the shots. It features a lobby on the first floor, after which only the museum on the sixth floor and the post-assassination themed exhibit on the seventh floor are accessible. Note the gift shop is located in a different building. State Fair . In autumn, the Texas State Fair is held at designated grounds southeast of downtown, vying with its Minnesota counterpart for the title of the country's largest state fair. White Rock Lake. Escape the city bustle for a stroll at this large park in East Dallas. Rodeo. Go see a rodeo show at the Mesquite Championship Rodeo . The Dallas-Fort Worth Metroplex is served by several colleges such as University of North Texas at Dallas (a public university affiliated with the University of North Texas in Denton), Southern Methodist University (a private university run by the Methodist church), University of Dallas (a private university run by the Catholic church), University of Texas at Dallas (a public research university that is part of the state public University of Texas System), University of North Texas in Denton (a public research university), and the University of Texas at Arlington (a public research university that is part of the state public University of Texas System). The University of Texas Southwestern Medical School is part of the University of Texas Southwestern Medical Center at Dallas, one of the largest grouping of medical facilities in the world and it is part of the University of Texas System. The facility currently enrolls 3,255 postgraduates and is home to five Nobel Laureates—four in physiology/medicine and one in chemistry. The Dallas-Fort Worth Metroplex has one of the largest concentrations of Fortune 500 companies in the U.S. with American Airlines, Southwest Airlines, Greyhound Lines, Capital One, JC Penney, Neiman Marcus, Fossil, ExxonMobil, Brinker International, Tenet Healthcare, Dean Foods, Fluor Corporation, Texas Instruments, AT&T, Nokia, Oracle, Ericsson, Alcatel-Lucent, Samsung, Toyota, State Farm, Cisco, 7-Eleven, FritoLay, Pizza Hut, Kimberly-Clark, etc. either being based or having significant operations in the area. The northern suburbs of Dallas was given the nickname "Silicon Prairie" due to the high concentration of technology and telecommunication firms in the area, particularly around North Dallas and the suburbs of Irving, Richardson, and Plano. In addition several major defense manufacturers, including Lockheed Martin, Bell Helicopter Textron, and Raytheon all maintain significant operations in the Dallas-Fort Worth area. Dallas is also currently the third most popular destination for business travel in the United States, and the Dallas Convention Center is one of the largest and busiest convention centers in the country, at over 1,000,000 square feet. Shopping is big in Dallas and the city and its suburbs have more shopping centers per capita than any other city in the United States and is also home to the second shopping center ever built in the United States. Many people come from all over the country to shop in Dallas' exclusive shops, including main street stores and boutiques, craft shows, antique shops, estate sales, yard sales, flea markets, farm stands, and farmers' markets, as well as several very large shopping malls. Popular shopping malls include the Galleria in North Dallas, NorthPark Mall, and the West Village in Uptown, among others. A bit further afield is Grapevine Mills in nearby Grapevine. Amazing malls can also be found in Frisco and other suburbs. Half-Price Books, . Used bookstore chain headquartered in Dallas, offering secondhand books, music and video, with offerings varying by location. The flagship store is in East Dallas, with one other Dallas store and nine more in the Metroplex area. Neiman Marcus was founded in Dallas, supplying dresses and diamonds to debutantes and family scions. The downtown flagship store remains a popular destination for visitors and locals alike, and the NorthPark Mall location is the chain's most successful location. 7-Eleven convenience stores (which got its start in Dallas) are abundant and always open 24-7, but they have limited selection and high prices. The major supermarket chains in Dallas are Kroger, Tom Thumb (which is owned by Safeway), Albertson's, and Fiesta Mart. In addition the nation's largest discount store chain, Walmart, has several stores in Dallas most of which are also open 24 hours and some Tom Thumb and Kroger stores in Dallas are also open 24 hours as well. Many specialty and organic supermarkets such as Whole Foods Market, Central Market, Sprouts Farmers Market, and Trader Joe's can also be found throughout the area. Due to its large expat and immigrant population, Dallas also features a large variety of ethnic grocery stores, including Indian, Korean, Japaneae, Chinese, Vietnamese, Russian, and of course, Mexican. These tend to be found in North Dallas, Northwest Dallas, West Dallas, and in the suburbs of Carrollton, Garland, Irving, Richardson, and Plano. Beltline Road through Addison and North Dallas, just north of I-635, has perhaps the most restaurants per-capita in the U.S. If there is a type of food you like then you can probably find it there. Greenville Avenue running north to south in East Dallas, has many restaurants along its length, particularly in Lower Greenville. Knox and Henderson streets (the "Knox/Henderson" neighborhood), off US-75 Uptown have many laid-back, stylish restaurants. McKinney Avenue, is the heart of Uptown, with a wide variety of quality establishments. The West End in the northwest part of Downtown has a good mix of original local restaurants and successful chain establishments. Dallas has a good number of its own chain restaurants which have become quite successful in the area, offering unique local flavors. Café Brazil, . Coffee shop chain with numerous locations throughout North Texas similar to Denny's. They also have free Wi-Fi and many locations are open 24 hours as well particularly on Friday and Saturday evenings. Cristina's, several DFW locations, . Lunch specials are very reasonably priced. Service across all of the family owned and operated locations is blindingly fast no matter the location. The chips and salsa are arguably some of the freshest and best in the Metroplex. A unique signature menu item is the "Queso Flameado" where the server melts cheese by fire tableside and then wraps the gooey cheesey goodness in several freshly made tortillas. Spring Creek Barbeque, . Spring Creek Barbeque has 15 Texas style restaurants across the North Texas area. The menu is very simple. Beef, ham sausage, turkey, chicken, and ribs are available for entrees (you can have combinations also). Side items available are corn, beans, potato salad, cole slaw, and baked potatoes. In addition, fresh homemade bread rolls are served with each dish and more are delivered to your table during each meal. Even with large servings, the most expensive menu is only about $10 so all of the dishes are available at a reasonable price. La Paloma Taqueria, . La Paloma Taqueria is a quick service restaurant specializing in authentic interior Mexican cuisine with six locations throughout the Dallas area. Tacos Y Mas, . Tacos Y Mas is a quick service restaurant specializing in authentic Mexican street tacos with four locations throughout the Dallas area. It was also mentioned to have "The Best Breakfast Tacos in Dallas" by D-Magazine in 2010. Online ordering is available. Main Street in Downtown has seen major improvements over the last few months, with plenty of places to eat and to play. Highly Recommended. Don't forget to stop by the City Tavern for a longneck or two. West End - This is an attractive enough historic neighborhood with buildings in a turn-of-the-century redbrick vernacular -- the notorious Book Depository is one of them -- in the northwest quadrant of downtown. The area is mostly popular with suburbanites and tourists out for dinner and a quick stroll around the neighborhood but has a number of bars as well. Deep Ellum is a historic district of bars, dance clubs, music venues and tattoo shops. located just east of downtown on Main, Elm and Commerce streets. It is a hipster haven for young people and a weekend destination for music lovers of all ages. Uptown and McKinney Ave - This neighborhood contains very upscale fashionable clubs. Lower Greenville has many older drinking establishments. Addison has some famous drinking spots tucked in amongst its many restaurants, notably The Flying Saucer. If you're looking to fill a mini-fridge or cooler with your own beverages a bit of planning might be required. Alcohol is only sold in certain parts of the city and in certain suburbs so getting to a liquor store can involve some travel. Also, Texas' liquor laws specify that any store that sells liquor cannot open on Sunday nor stay open after 9PM any other day. Stores that sell beer and wine cannot sell either from 12AM to 12PM on Sunday. A smartphone app that locates liquor stores is very useful as many of those stores in the Dallas area tend to be well inside neighborhoods as opposed to along highways, and hotel desk staff can tell you if you're in a 'wet' or 'dry' area of Dallas. Liquor stores can become quite crowded after 8PM (especially on Saturday) and remember to be extra-alert after dark. In 'wet' areas beer and wine is easily and safely available at grocery stores. CentralTrack.com,  is a Dallas focused music and nightlife blog popular among the outgoing "20-somethings" crowd. This digital publication curates a fresh list of events and happenings for each week day and weekend. Dallas Observer,  is a local alternative weekly. You can pick up a free copy at many places around town including many bars and restaurants. It is full of useful information on Dallas nightlife and its music-scene offerings. The heaviest concentrations of hotels can be found in North Dallas along I-635 and North Central Expressway and in Northwest Dallas along I-35E, while Downtown offers more high-end accommodations. Some travelers may find it more convenient to stay in Irving closer to DFW airport, in Arlington near the amusement parks, or in one of the northern suburbs such as Lewisville, Carrollton, Plano, or Richardson. When in doubt, as a rule of thumb, try your best not to venture out to any areas west, south, or southeast of Downtown Dallas (the area between Interstate 35 E, Interstate 30/ Highway 67, and Interstate 20) unless you have a specific reason to or are going with a group. Avoiding these areas after dark is recommended. Take caution in Downtown after dark, especially on weekends. If possible, avoid riding buses and trains after 9-10 PM and before 6 AM. If you stay north, northwest, or northeast of downtown or in any of Dallas's suburbs, you'll be well off and should then just take the usual precautions. Just use common sense. Despite public headlines showing decreases in crime figures, there are some who believe the decrease is due to creative accounting and crime remains higher than average. Regardless, be careful in these rough areas: South Dallas (generally south of I-30), West Dallas, and certain parts of East Dallas (Skillman at LBJ Freeway for example). DART Light Rail Lines, while growing in convenience, do not use turnstile ticket machines and stations are often unsupervised, so use caution while on the trains as homeless and panhandlers are common. It should be noted that residents of Texas are allowed to carry concealed firearms after completing training and a thorough background check. Dallas Central Library, 1515 Young St., Tel: 214-670-1400, . Kadampa Meditation Center Texas, Tel: 817-303-2700, . Offers relaxation meditations and meditation classes to increase inner peace at 4 locations in Dallas. The Dallas Morning News - The primary newspaper in Dallas and North Texas. Al Dia - The primary Spanish language newspaper in Dallas. Dallas Observer - An alternative, free weekly newspaper which focuses on lesser-known news as well as movies and local events ranging from current theatrical productions to concerts. Dallas Telegraph - Russian language newspaper in Dallas. Dallas Chinese News - Chinese language newspaper in Dallas. Korea Daily Texas - Korean language newspaper in Dallas. Dallas Business News - Dallas business news. Dallas Culturemap - An alternative, free weekly newspaper which focuses on lesser-known news as well as movies and local events ranging from current theatrical productions to concerts. Denton, half an hour north on I-35E, has a charming historic town square, and an active nightlife scene driven by the city's disproportionately large number of musicians. Joe Pool Lake  lies to the southwest of the city, 4 miles past Grand Prairie. There are two popular parks to camp at along the shoreline, including Cedar Hill State Park  and Loyd Park . The most popular day use park on Joe Pool Lake is Lynn Creek Park . Lake Texoma is a popular spot an hour's drive north on US-75, on the border with Oklahoma. Southfork Ranch, 3700 Hogge Rd, Parker, tel. 972-442-7800, . The ranch made famous by the TV series "Dallas". An easy day trip from Dallas. Tours run 364 days a year (except 25 Dec). Waco, an hour south on I-35, has a number of attractions including the Dr. Pepper Museum and the Texas Ranger Hall of Fame. Tyler, an hour and half east on I-20, Nicknamed the Rose Capital of the World due to the Rose industry. Be sure to check out the Rose festival in October! This page was last edited on 6 April 2019, at 00:43.